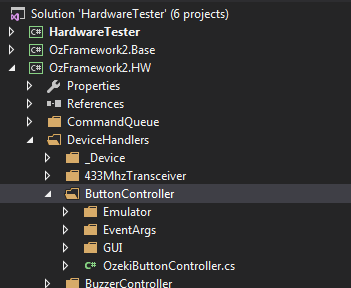 The below seen image demonstrates the communication between the hardware elements (microcontrollers) and the .NET type controller softwares belonging to them. These microcontrollers are connected through a serial port to the PC. More softwares can be installed on a microcontroller. For the operation of the softwares installed on the microcontroller a .NET software is required even for the computerized page. Microcontrollers can have different installed software. E.g. : EEPROMController, MotorController, ButtonController etc..., these softwares are called devices. The softwares installed on the microcontroller have computerized software pairs which make it possible to configure the hardware. The functions belonging to the given Device are emulated here therefore in case of a hardware deficit the performance of the Device can be emulated. 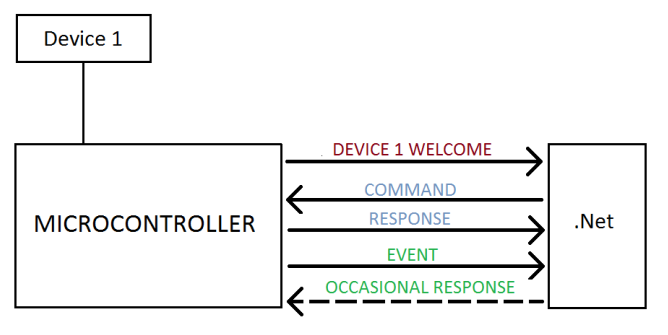 Communication with the Device is possible without connecting a microcontroller. A GUI belonging to the Device have to be implemented in an appropriate way according to theprotocol.txt which can be found in the C:\Work\Development2\OzFramework2\OzFramework2.HW.Arduino\OzekiLibs\DEVICE folder.